Posted 10th December 2015 by Paddy & filed under Uncategorised. If you place an order after the aforementioned dates, we will not be able to guarantee that you item will arrive in time for Christmas. All dates are based on the Royal Mail Latest Recommended Posting Dates for international orders. However, we will continue to post items after these dates in hopes that they make it under your tree! Posted 30th September 2015 by Paddy & filed under Uncategorised. After 8 delicious weeks, it’s time for the semi-final! Since the start of August, we’ve been drooling in front of the TV over the sight of signature cakes, technical biscuits and showstopping pastries. Sadly, next week it all comes to an end, as Mary and Paul announce the winner of the 2015 Great British Bake Off! Do you want to pay full price for your t-shirt? Although we’re rooting for Tamal and Flora, we’ve got no idea who’ll be in the final, but needless to say, we’re excited. At Dressdown, we’ve caught the baking bug BADLY. At any one given time, there will be a homemade brownie, muffin or cake somewhere in the office! We’ve got cake on the brain so much so, that we’re offering 15% on all of our baking t-shirts, when you use the discount code CAKE15! If you’re a star baker, then check out our HUGE range of new baking t-shirts and hoodies! Posted 21st September 2015 by Paddy & filed under Sport. To celebrate the already awesome 2015 Rugby World Cup, we’re offering a huge 15% off of absolutely everything at Dressdown.co.uk! Without ranting and raving about the Japan vs. South Africa too much, it’s needless to say that we’re off to an exciting start. If these six weeks weren’t going to be awesome enough, when you use code RUGBY15 at the checkout! If that wasn’t enough, all of our t-shirts and hoodies are 4-for-3, even when using the discount code; and come with free UK delivery. Posted 30th June 2015 by Paddy & filed under Uncategorised. Anyone for a spot of strawberries and cream? If you’re heading to Henman Hill this July, then check out a huge range of Wimbledon inspired, tennis, sports and TV t-shirts. Not only will you get 15% off everything at Dressdown.co.uk, but you’ll still be eligible for our buy-3-get-1-free sale, AND free UK delivery. 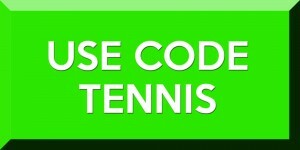 So make sure you’re looking your best for Wimbledon, with Dressdown.co.uk! Posted 27th May 2015 by Paddy & filed under cats. Are you crazy for cats? This week at Dressdown.co.uk, we’re going a little bit moggy mental with our range of new t-shirts and hoodies. So we’ve decided that we’re dedicating this week to one of our favourite and fuzziest animals: The Cat! Not only this, but all our items on store come with FREE UK DELIVERY, and are available for a buy-3-get-1-free! But hurry, Crazy Cat Week ends Sunday 31st May! Posted 2nd April 2015 by Paddy & filed under Uncategorised. Finally, the long weekend is here! To celebrate, we’re having our BIGGEST sale ever! Get a whopping 25% off absolutely everything at Dressdown.co.uk this Bank Holiday weekend, when you use code EGG25 in your basket! No catches, no minimum spends, just a fantastic discount on a huge range of t-shirts, hoodies, baby clothes and more! If that wasn’t enough for you, you can still take advantage of our incredible UK Free Delivery and Buy-3-Get-1-Free offers when using the code! Save a bundle this Bank Holiday weekend when you use code EGG25! Click here to see our full range! Posted 1st April 2015 by Paddy & filed under Uncategorised. Since the start of the year, we’ve been working on dozens of secret little projects, in hopes of introducing new lines of products to our clothing portfolio. Back in January 2015, we invested in revolutionary 3D printing technology, and after printing our first ever t-shirt back in February, we decided to go a step further. By using a synthetic blend of sugar-cotton fibres, we were able to print a light-weight casual-fit t-shirt that was 100% edible. The material is durable and comfortable to wear; similar to that of a strawberry-lace (without the stickiness). 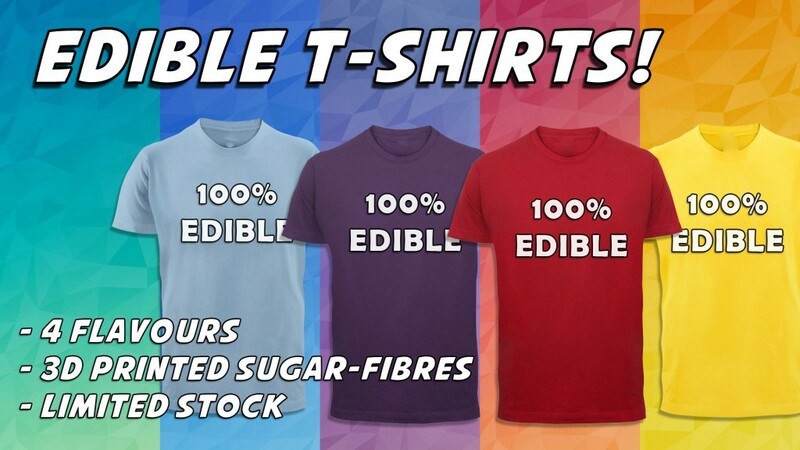 Eventually, after deciding on four delicious flavours and acquiring our first ever food license, our first ever edible t-shirt will be going on sale at midday today! …but we are hoping to release more flavours soon! We currently only have 100 of these items in stock (25 of each flavour), which will be available at this link. The garment is only recommended to be worn once, and should not be washed or worn in the rain! As delicious as they look! Posted 26th March 2015 by Paddy & filed under Uncategorised. Win a £15 Dressdown.co.uk voucher! 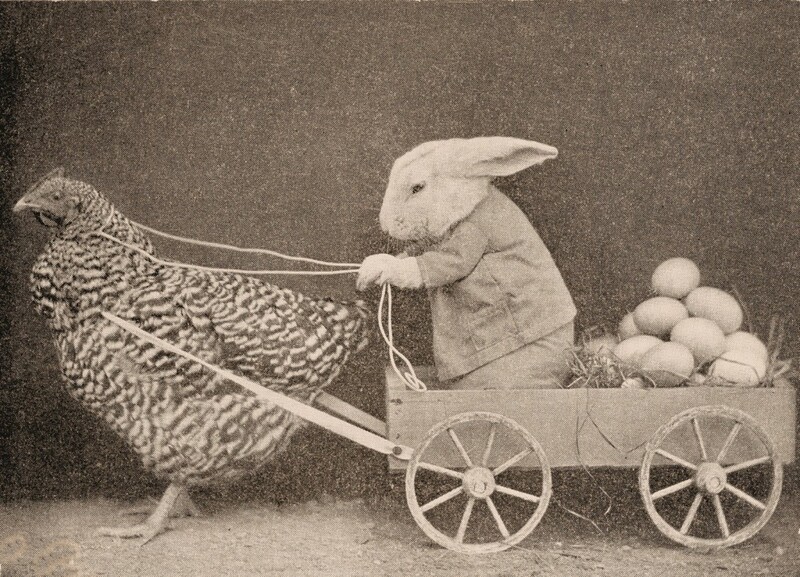 There’s a long weekend around the corner, and Dressdown.co.uk are on hand to make sure you have a great Easter! If you’ve got a caption you think would be perfect for our eggs below, hop over to our Facebook Page and let us know in the comments. Should your caption be the best, you’ll win a £15 voucher to spend on anything on DressDown.co.uk. You’ve only got a few days to enter our Easter Caption Competition, as the winner will be announced on Thursday 2nd April! Good luck! For more information and all the t&c’s, see below. The competition will be run solely on Facebook page: www.facebook.com/dressdown. All entries must be made in the comments section of the Caption Contest Facebook post, all entries that fall outside of this remit will not be considered valid. The prize consists of 1 x £15 DressDown Voucher. The prize can only be used on DressDown.co.uk, and cannot be exchanged for a monetary equivalent. The prize can only be used for one transaction on the DressDown website, and will become invalid once the first purchase has been made. The competition will end on Thursday 02/04/2015 at 14:00. All entries made after this point will not be valid. The winner will be announced on 02/04/2015 at 20:00 via Facebook. Should a competition entry be considered as offensive or irrelevant, DressDown.co.uk have the right to remove the comment from Facebook and consider the entry as invalid. The winning caption will be selected by a panel of DressDown employees, and thus subjective to their interpretation of what makes a ‘winning caption’. Should the winner be asked to provide a Social Media ‘mention’ or ‘tag’ by DressDown, the winner must comply. Should they not comply, their prize will become invalid. Posted 3rd March 2015 by Paddy & filed under Uncategorised. Win 1 of 10 T-Shirts in our Mother’s Day Competition! We’re racing though 2015, and our next stop is Mother’s Day. There’s so many fantastic mums out there, so we thought we’d do something special! If you know a great mum, then let them know with our awesome Mother’s Day competition. All you need to do is head over to the Dressdown Facebook Page and tag a great Mum in our latest post! It doesn’t have to be your mum, just a fantastic someone who is a great mum! Head over to our competition Facebook post and TAG the best mum’s you know, and it’s that simple! Then on Wednesday 11th March, we’ll select 5 winners from random, and award them and their chosen mum with a free t-shirt each! 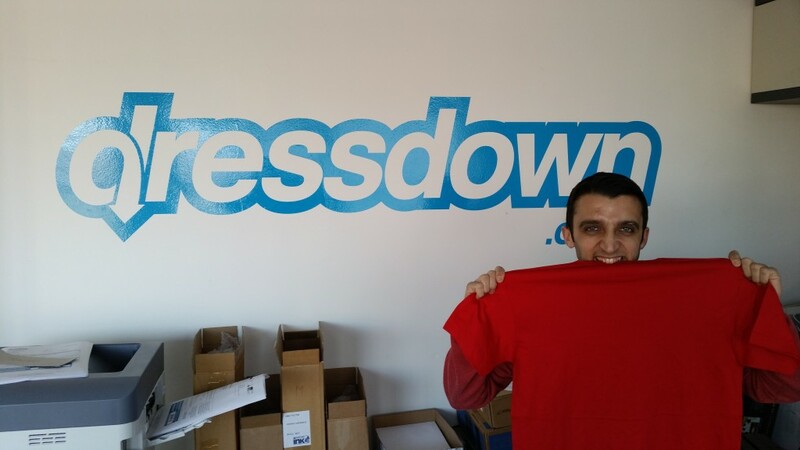 The prize consists of 1 x coupon code that will discount £12.95 (the price of one t-shirt) off any order on Dressdown.co.uk. The prize cannot be exchanged for a monetary equivalent. The competition will end on Wednesday 11/03/2015 at 14:00. All entries made after this point will not be valid. The winner will be announced on 11/03/2015 at (or around) 20:00 via Facebook messages. The winning entries will be selected at random. Posted 10th February 2015 by Paddy & filed under Uncategorised. There was BIG news coming out of Marvel Studios last night, as it looks likes everyone’s favourite web slinger maybe being recruited for The Avengers! Since 1999, Sony Pictures have solely owned the rights to the Spider-Man movie franchise. However, it was reported last night that Sony and Marvel Studios have reached an agreement that will shake the world of comic fans and film buffs alike. Spider-Man will be joining the Marvel Cinematic Universe! The Sony/Marvel agreement will give fans the chance to see Peter Parker teaming with the likes of Hulk, Iron Man and Thor! 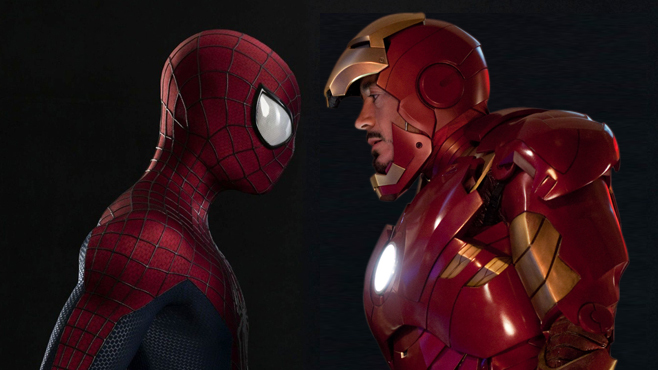 We know that Robert Downey Jr will be reprising the role of Tony Stark, but who will be the new Spidey? This agreement isn’t just a win for Marvel Studios, but will also be huge for Sony, who will be releasing a new Spider-Man movie in 2017. No news has been released as to whether the new Spider-Man will be ANOTHER reboot; but with Marvel’s Kevin Feige as co-producer, there is talk of a new direction for the webslinger. Sorry to all Andrew Garfield fans, his web-slinging days are over. The news isn’t without a ripple effect. A number of Marvel’s Stage 3 movies will be pushed back by almost a year! So it’s bad news for anyone pining for the new Thor, Black Panther, Captain Marvel or Inhumans movies!